Visit Taxseer.com to e-file Form 1099 Misc, Other 1099 Series Forms, W-2, ACA Forms (1095 B & 1095 C) and extensions. Trusted by over 21000 businesses due to the highly secure and modern solution at a very competitive rate . Tax Professionals can efile forms for unlimited businesses through a single account. Role-based access control for users in the team. Highly scalable solution for enterprises. Taxseer2290 is an IRS Certified & Authorized e-file service provider of form 2290 - Schedule 1 and form 8849 - Schedule 6 for Business Owners and Tax Preparers. e-File form 2290 or amend your return (for VIN Correction \ gross weight increase \ mileage increase ) or claim credits (Form 8849) for sold \ destroyed \ stolen \ low mileage vehicles through the step-by-step Taxseer2290 online services. 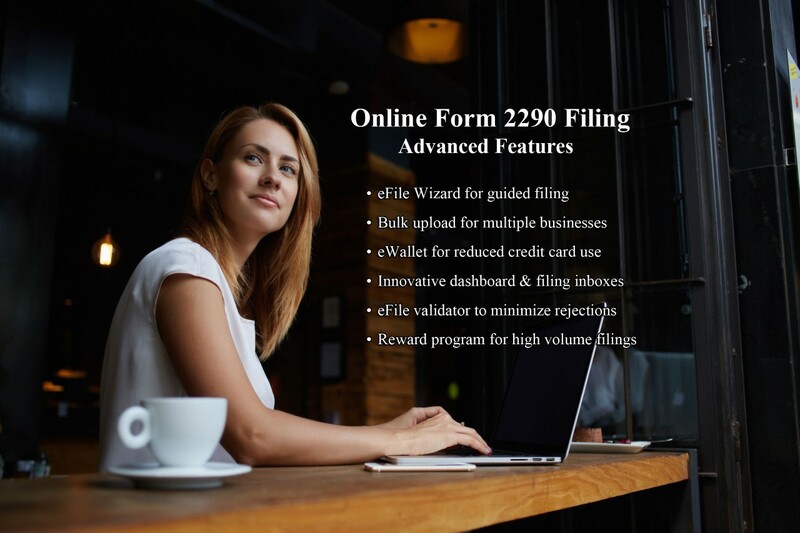 e-File Form 2290 and save your time and relieve youself from printing and mailing paper forms and waiting for long time to receive your Stamped Form 2290 Schedule 1. Heavy Highway Vehicle Use Tax (HVUT) is the annual tax assessed on heavy vehicles that operate on public highways and having taxable gross weight equal to or more than 55,000 pounds. If the heavy highway vehicle is registered in your name at the time of its first use during the tax period then you should file Federal Tax Form 2290 before the Form 2290 due date and obtain the IRS Stamped Form 2290 - Schedule 1 (Proof of payment). New truckers often have questions in mind as to why e-file 2290 form instead of filing paper form directly with the IRS. There are many benefits of IRS HVUT form 2290 e-file using the services of Taxseer2290.com, an IRS approved e-file service provider , including the Form 2290 - Schedule 1 delivery within 10 minutes of filing by flexibly using multiple IRS Payment Options . 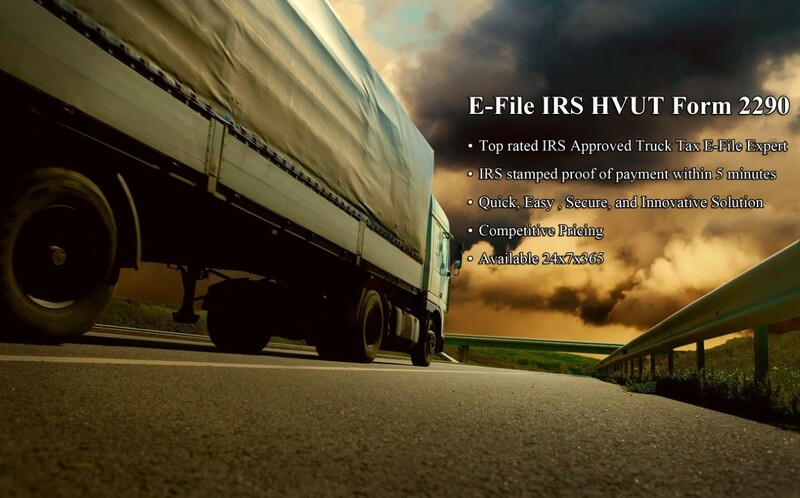 To start your Form 2290 e-file, you should have the information about the Employer Identification Number (EIN) of the business, Vehicle Identification Number (VIN) of the vehicle(s), Taxable Gross Weight of the vehicle(s), Third Party Designee information, and the IRS Payment Option that you would like to use to pay your truck taxes. 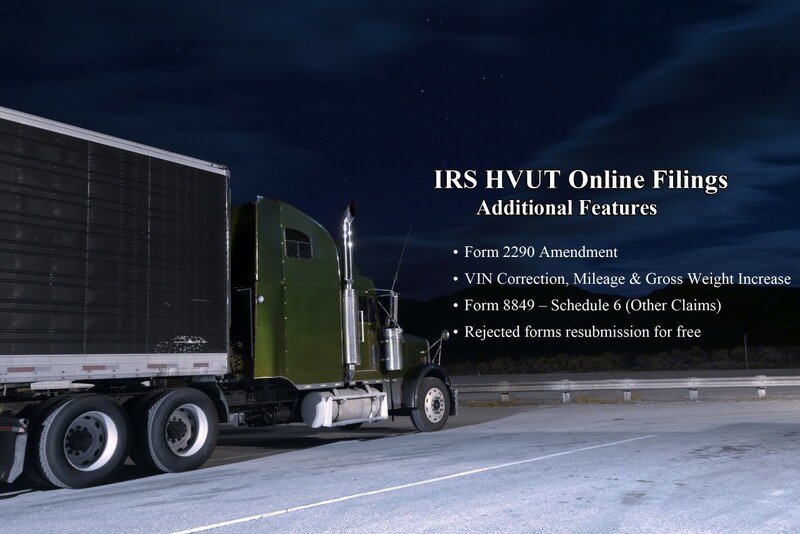 Clear unserstanding of Form 2290 Taxable vehicles, Suspended vehicles, Logging vehicles, and Agricultural vehicles will go a long way to prevent you from over paying your HVUT to IRS. You can perform IRS Form 2290 Amendments for VIN Correction, Taxable Gross Weight Increase, and Mileage Increase. Claiming credit for sold / destroyed / stolen / low mileage vehicle(s) can be easily performed by filing form 8849 - Schedule 6 (other claims). If you fail to e-file form 2290 before the due date then HVUT Penalties are imposed by the IRS for the delay and a separate notice is sent for the same. If you are a trucker with a vehicle that has a taxable gross weight of 55,000 pounds or more, you are required to electronically file HVUT Form 2290 to get a stamped copy of your Schedule 1. Out multi-tenant solution allows Tax Professionals to manage various Business information under one single account and freely perform HVUT efiling for their Vehicles. Create unlimited users under the account and create configurable roles for them. Use Form 8849 if your vehicle was sold, stolen, destroyed or for any low mileage vehicle on which the tax was paid on Form 2290 and the vehicle was used 5,000 miles or less on public highways (7,500 or less for agricultural vehicles) during the tax period..
You can submit Amendments for any required corrections in the VIN, Taxable Gross Weight increase, and Mileage exceeded. Our users are amazed at our utter cost effectiveness and simplicity of design which has facilitated flawless e-filing of HVUT Form 2290 by 99% of our users without any support from us. Wizard-driven e-filing for guided and error-free submissions. Fully automated e-filing background process provides Schedule 1 in minutes after Form 2290 submission. Easily perform form 2290 amendments for VIN Correction, Taxable Gross Weight increase, and exceeding Miliage limit. Our charges are competitive due to the efficient & well-designed e-filing system that consumes less resources. Manage all clients through a single account at discounted rate. Easy self e-filing owing to our great User Interface design. We use SSL-encrypted connections for transferring sensitive information. Extend the security, intelligence, availability, and agility of the application on cloud. As part of our commitment to make e-filing easy and convenient, we are always available. Taxseer2290 performs many automated tasks behind-the-scene to ensure that all Form 2290 & Form 8849 e-File requests submitted by you are e-filed to the IRS system, get the Schedule 1 after the filing is accepted by IRS, and provide you the real-time updates of the e-filing status. Set up your Business record(s). Set up your Vehicle(s) record(s). Fill out the on-screen forms detail. Review and submit your completed forms. E-file your forms directly to the IRS. Get the Schedule 1 from IRS system on successful acceptance. Notify you for accepted / rejected filings. Allow free & unlimited resubmit of the rejected returns. Notify you via email at every critical workflow steps. Store your form data on our secure servers on cloud. Taxseer2290 is a leading IRS-authorized e-file service provider offering you the best cloud-based solutions to perform online filings of Forms 2290, 8849, 2290 Amendments, 1099 series, W-2, ACA (1095-B & 1095-C), and many more. Taxseer2290 is Maryland based business started by technocrats having more than 20 years of experience developing products for Internal Revenue Services (IRS), Global Trade Management, HealthCare, Defense, Human Resources & Development, & Payroll. We have vast experience integrating software products with major ERPs like SAP, Oracle Apps, and Peoplesoft. One of our biggest achievement has been to develop user-friendly online applications so that users require minimal support during the entire process. 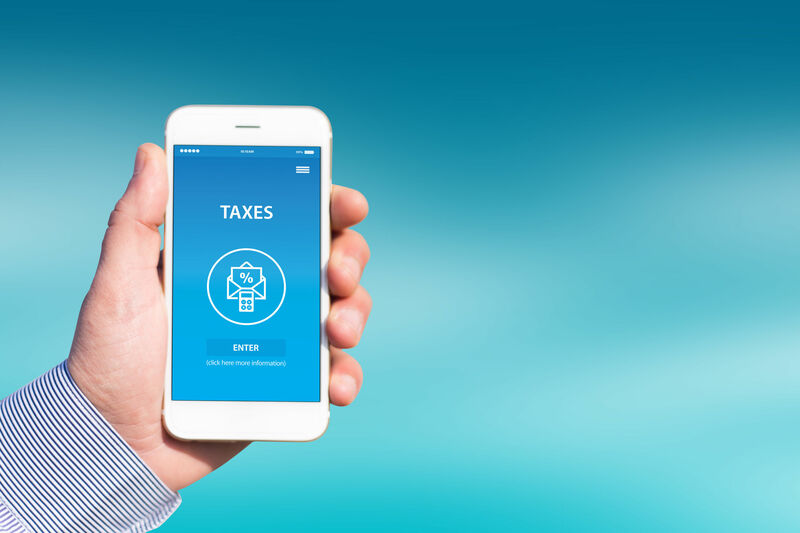 Our recent reports have shown that around 99% of our users are able to register and file online taxes through Taxseer2290 without needing any support from us. While other vendors are struggling to manage their ill-designed applications by increasing their support staff, we have in fact been able to reduce the support staff and pass the savings to the customers. Our happy customers have requested us to cover more IRS forms and Taxseer2290 team is working hard to fulfill these requirements at the earliest. 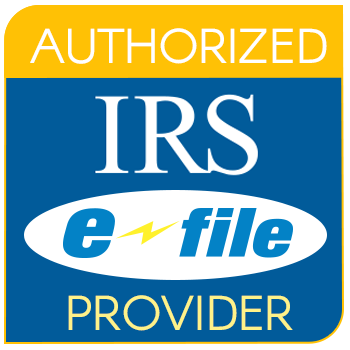 IRS approved e-file service provider for forms 2290, 8849, 2290 - Amendments, 1099 Series, W-2/W-2C, ACA (1095 B & 1095 C), & Extensions.